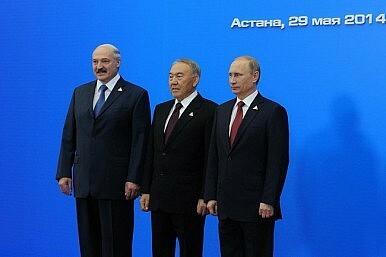 As the Eurasian Economic Union takes effect, Kazakhstan maintains its ambitious economic diplomacy. Kazakhstan has unveiled a new investment campaign and commercial, “Invest in Kazakhstan” aimed at attracting foreign investment. The commercial highlights the benefits for foreign investors: Exemption from corporate income tax, land tax, property tax, and customs duties for 10 years, “state-in-kind grants, stability of investment legislation, strong protection of investor’s rights, no work permits for foreign labor, visa-free entry for citizens of many countries,” and “still not good enough? Thirty percent cash back on your investments.” With these economic lures, Kazakhstan seems to offer a lot to foreign investors, but how stable is the investment climate in Kazakhstan? Kazakhstan, often self-referred to as the “Eurasian bridge,” saw its GDP growth rate spike in 2006, only to drop in 2009, then climb back up to 6.0 percent in 2013. According to available figures, the country has a foreign direct investment (FDI) inflow of 14.0 billion and 5.4 percent unemployment. Kazakhstan experienced the effects of the global economic downturn, but averted economic disaster with the policy of “Nurly Zhol,” designed to protect the country and its people from the economic crisis. Money (savings) from the National Oil Fund – “a nest egg established by the government in 2001 to save oil income for future generations” mitigated budgetary-related shocks which “[stabilized] banks with a large-scale policy package.” Kazakhstan’s low public debt, less than 20 percent, helped ameliorate larger economic shocks. Nurly Zhol was announced as the new economic policy of Kazakhstan in late-November 2014. The policy is aimed at stimulating the economy through infrastructure investment and the Kazakhstan-2050 Strategy development plan. China has already contributed construction materials. Indeed, China and Kazakhstan have many partnerships, most which are oil, gas, and infrastructure centric. Kazakhstan has also dropped visa requirements for many desirable trading partners such as the U.S., Germany, Italy and France. There are 10,000 foreign-owned businesses in Kazakhstan and many global investment firms have offices, highlighting the country’s FDI potential. Geographically, Kazakhstan is close to three of the BRICS countries. It has also established a number of special economic zones (SEZ) tailored to separate industries such as tourism, chemical and petrol production, and light industries, with special legal regulations. The SEZs will be governed by the Ministry of Industry and New Technologies. Half of Kazakhstan’s “foreign trade and foreign direct investments belong to the EU” and Astana has also signed a “so-called agreement of the second generation” covering many issues that would have an impact on the Kazakh economy. Many Western (including U.S. and U.K.) gas and oil companies are active in Kazakhstan. Chevron has been in Kazakhstan for 20 years, and the company continues to have holdings in the Tengiz and Karachaganak oil fields. Long-term cooperation is something that Kazakhstan welcomes. Still, there are many disadvantages to investing in Kazakhstan: a landlocked geographic location, “lack of experience and financial capabilities among representatives of the Kazakh business community” with a non-democratic government, corruption, lack of transparency, lack of civil rights/liberties, and an uneducated workforce. Kazakhstan’s political and diplomatic dealings could also have implications for investment. Foreign companies are reluctant to invest in state-owned enterprises or joint-stock companies given complications with government and state regulations, the possibility of re-nationalization, and disagreements with governments over the equal distribution of funds or the notion that a government might feel like it is being cheated (as seen in Kyrgyzstan’s Kumtor gold mine). Kazakhstan’s human rights record and the squashing of opposition media could deter some foreign investors, although it doesn’t appear to have put off multinational oil companies. A controlled press and a lack of political party pluralism are other concerns within the international community and among Kazakhstan’s potential Western economic partners. Transparency International 2014 figures ranked Kazakhstan 127 with a number of 29 on the corruption scale (from 0, very corrupt, to 100, very clean). This is a slight improvement from previous years. From a geopolitical perspective, Kazakhstan’s multi-faceted and seemingly unshakeable ties (security, political and economic) with Russia could deter foreign investors such as the EU and the U.S. given Russia’s current aggression in Crimea. Eurasian Economic Union (EEU) regulations might hurt Kazakhstan’s ability to attract investors. The EEU, which took effect on January 1, brings Kazakhstan, Belarus, Russia (and now Armenia, with Kyrgyzstan to join in May) under one economic organization. Kazakhstan’s economy is linked to Russia’s and the sanctions placed on Russia have hurt Kazakhstan’s economy. What is interesting about the core EEU members is that all three countries are authoritarian – Kazakhstan being the “softest” – but all have different styles of economies. Kazakhstan’s economy – resource based and insufficiently diversified – is arguably not compatible with the EEU, but the EEU has been a vision of Nazarbayev’s since the 1990s and adds to his regional vision of economic integration. The EEU has been described by opposition in Kazakhstan as a form of new Russian colonialism. Nazarbayev repeatedly has stated that Kazakhstan’s membership in the EEU would not compromise its independence or sovereignty. Even so, Nazarbayev’s multi-vector foreign policy is giving Kazakhstan an expanded reach, political, military, diplomatic, and economic. The country continues to work on pipeline projects with China, and other projects with the European Union, the U.S., and other Central Asian countries. Clearly the establishment of the EEU does not mean that Kazakhstan is abandoning its carefully cultivated economic relationships with other countries. Its deep ties with Russia do not seem to have derailed Astana’s relations with its European partners. Take Poland, for example. “Trade turnover between the two countries has amounted to $800 million,” as Poland delivers vehicles and equipment and Kazakhstan exports petroleum and chemical products. Economic relations continue to grow, as part of Poland’s larger plan to promote Polish exports. Kazakhstan has also asked the Czech Republic to assist in the diversification of Kazakhstan’s economy with the building of a non-resource-based economy. Nazarbayev has also encouraged the Czech President, Milos Zeman, to build Czech factories to export goods to Russia and to Belarus duty free. This would further integrate many Eastern European markets with Kazakhstan. The relationship between Kazakhstan and Czech Republic will help the latter meet its energy needs, as Kazakhstan is a major producer of gas and oil. Like Kazakhstan, Czech Republic has been able to choose economic alliances that will ultimately strengthen the bond between the two countries. How will the EEU affect Kazakhstan’s partnerships with the West? By joining the EEU, Kazakhstan will further solidify its position in the region as a leading economic force, one that is party of many banking initiatives and organizations such as the China-led Shanghai Cooperation Organization. With this positioning, Kazakhstan is helping to offset any of the economic fallout from the collapsing Russian ruble, the effects of the Russia sanctions, and the EEU. From a financial standpoint, Kazakhstan is an investment-friendly country, but Astana’s political alliances may hold it back from reaching the status it desires. Ultimately, a more open civil society would boost Kazakhstan’s standing not only in financial circles but in political circles as well. Samantha Brletich is a contributor and Advisory Board Member of Modern Diplomacy.